FACT CHECK: Did Macaulay Culkin Say Satanic Hollywood Executives Wear Shoes Made From Dead Children? Fake news sites reported that the former child star says Hollywood is run by Satanic pedophiles who ritually murder children. 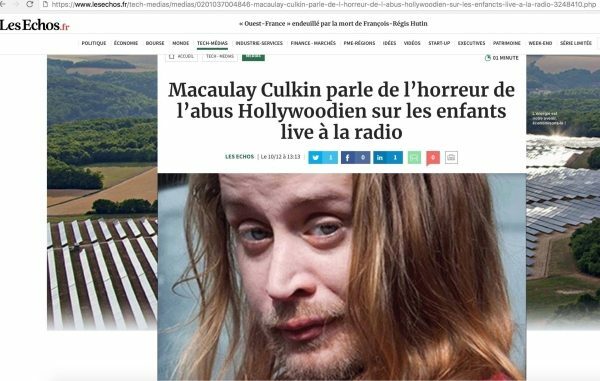 Former child star Macaulay Culkin said Hollywood is run by Satanic pedophiles, one of whom boasted that his shoes were made from the skin of deceased child actress Heather O'Rourke. In December 2017, a number of disreputable web sites published articles alleging that former child actor Macaulay Culkin (perhaps best known for his recurring role in the 1990s movie franchise Home Alone) said in a radio interview that Hollywood is controlled by “Satanic pedophiles” who ritually murder children. Three slightly different versions of the same story appeared on YourNewsWire, NeonNettle, and NewsPunch, a trio of interrelated sites known for producing fabricated and/or sensationalized clickbait content, on 12 December. The material has since been aggregated by other fake news web sites as well. Hollywood is controlled by Satanic pedophiles according to Macaulay Culkin, who opened up in a radio interview, describing how one Hollywood executive tried to get him hooked on crack at the age of 11 and boasted that his tailor-made leather shoes were made from the skin of dead child star Heather O’Rourke. 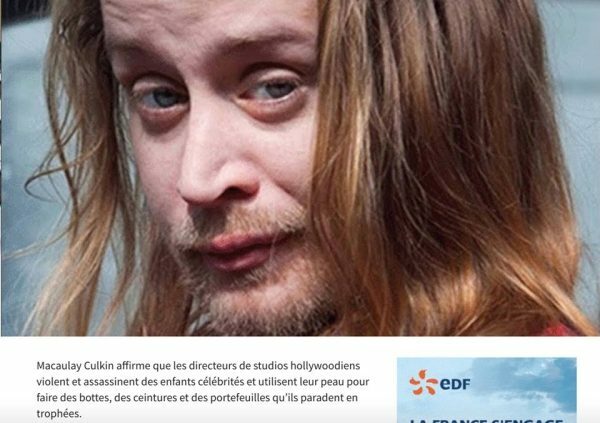 The explosive claims made by Culkin were reported by French media including Les Echos, a newspaper, however all reports were quickly deleted within an hour of appearing online. However, as we were able to confirm with the help of Guillaume Brossard, founder of the French-language fact checking web site HoaxBuster, no such article appeared on the Les Echos web site, nor would such an article ever appear there. Les Echos is known for serious reporting on economic and political issues. They do not publish celebrity gossip. Moreover, Brossard tells us, the small amount of French readable in the screen shots is egregiously bad, and most likely translated to French from English using a service such as Google Translate. We found no evidence in French media sources or anywhere else that the alleged interview ever took place. Nor has Macaulay Culkin made statements on other occasions resembling those attributed to him above. Although some former child actors, including Lord of the Rings star Elijah Wood, have gone on record stating that there does exist a dangerous “underbelly” of pedophilia in the movie industry, Macaulay Culkin, to date, has not been one of them. Lastly, apart from on fake news and conspiracy theory web sites, actual accusations of pedophilia and the sexual exploitation of minors in Hollywood aren’t typically accompanied by talk of Satanism, ritual murder, or “skin trophies.” Stories like this only serve to muddy the waters.